What is the latest version number? The latest version available in Ovi store is 2.0.0 for touch devices and 1.1.2 for non-touch devices. 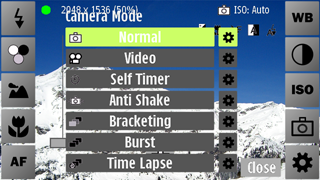 Taking pictures with CameraPro seems to be slower than with the built-in camera application! CameraPro processes images in background, so you can capture more images directly after taking a picture. But CameraPro provides 100% quality (=raw jpeg) by default which results in up to 5 times larger image sizes (like 10 MB instead of 2 MB). Thus sometimes CameraPro can be a little bit slower than the built in camera when taking pictures with 100% quality. – Expert video mode to gain full access: custom frame sizes (up to HD), video/audio bitrates, video/audio codecs, frame rates (from 1 to 30fps).